India has a keen interest in expanding exports to China through the China International Import Expo (CIIE), as the South Asian country hopes that any such increase could help reduce its trade deficit and ease depreciation pressure on the rupee. However, India should export services like IT-related services instead of commodities to narrow the deficit with China, experts said. On Tuesday, subsidiaries of the China National Machinery Industry Corp (Sinomach) signed 21 import purchasing contracts. One contract was signed with India-based salt supplier Rankers International for industrial salt, Sinomach told the Global Times on Thursday. On Tuesday, India-based Jay Shree Tea & Industries signed a $1 million export contract with China's State-owned grain trader COFCO for exports of Indian black tea to China, according to a statement released by the Indian embassy in Beijing. 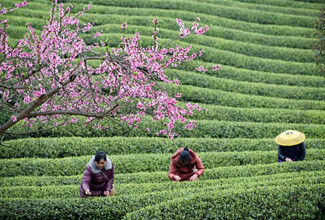 The statement said that China is India's 10th-largest tea export destination, but this ranking is "poised to be improved" with more Indian tea finding its way into the Chinese market. At the CIIE, the Global Times saw that agricultural products including sugar, rice, soybean meal and rapeseed meal were showcased at the Indian National Pavilion. Tourism and pharmaceutical services were also on display. "The expo is going very well. So far, we have had inquiries for Indian rice, sugar, black tea, soybeans, soymeal, rapeseed meal and spices," Manoj Kumar, assistant manager of the National Agricultural Cooperative Marketing Federation of India, said, noting that business prospects are bright. The Indian and Chinese governments are working to resolve the bilateral trade deficit. According to the Economic Times on Wednesday, Indian Commerce Secretary Anup Wadhawan, who is visiting Shanghai to attend the CIIE, has expressed concerns to Chinese government officials regarding the large trade deficit. China imported $15.55 billion worth of goods from India while it exported $64.2 billion in products to India in the first 10 months this year, customs figures showed. Wang Haixia, an expert with the China Institute of Contemporary International Relations, told the Global Times on Thursday that India values the Chinese market. The potential demand from China could drive India's industrial output and boost its economy, which, despite a fast GDP growth rate, is still vulnerable to external factors such as oil price hikes. Zhao Gancheng, director of the South Asia Studies Department at the Shanghai Institute for International Studies, forecast that Indian companies would be more active in future CIIEs, following the publicity given to this year's CIIE deals. "This is the first CIIE, and Indian companies don't know much about it. When Indian companies hear about the deals signed during this event, I think they will be more motivated to attend future CIIEs," he noted. Experts also urged India to consider exporting industries in which it has an advantage such as IT-related services. She also suggested that the best way to shrink India's trade deficit with China is to roll out appealing policies to attract Chinese companies to set up local factories. Zhao noted that India can export more agricultural products to China.